But don’t worry, we’ll walk you through all the necessary steps and show you how to fix a garage door that just doesn’t want to open. To make things a little easier, we list the possible fixes from least to most difficult, so you don’t go through any unnecessary trouble. Read on to learn how to troubleshoot a garage door that’s not opening properly. 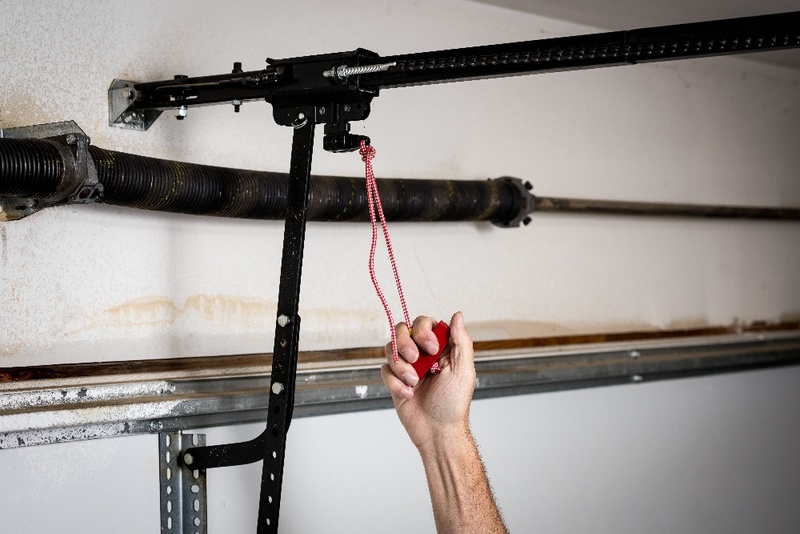 Pulling that cord disengages the garage door from the motor, so your garage door would essentially be manually-operated while the release is on. The good news is, turning off the release is as easy as turning it on – simply pull the cord again, hit your garage door remote, and your garage door should pop right back on track. You might say that your garage door opener is the brains of the operation, and that the torsion springs do most of the heavy lifting. The torsion springs are a pair of tightly wound coils usually located right above your garage door. It’s the tension stored in those springs that actually gets your heavy garage door to move up and down. If you hear your garage door trying to open but it doesn’t, or if you have a garage door not opening completely, a quick visual inspection can show you whether the torsion springs are damaged or broken. Look to see if there are any gaps between the coils – if so, the torsion spring is likely the culprit. If you were at home when a torsion spring snapped, you may have heard a loud explosion-like noise from your garage. If your torsion spring needs tightening or replacing, we highly recommend calling a professional service – the tension stored in the springs holds a lot of energy, and is a tricky fix even for experienced DIY-ers. Attempting to tighten or fix a torsion spring on your own frequently results in serious or even fatal injury. 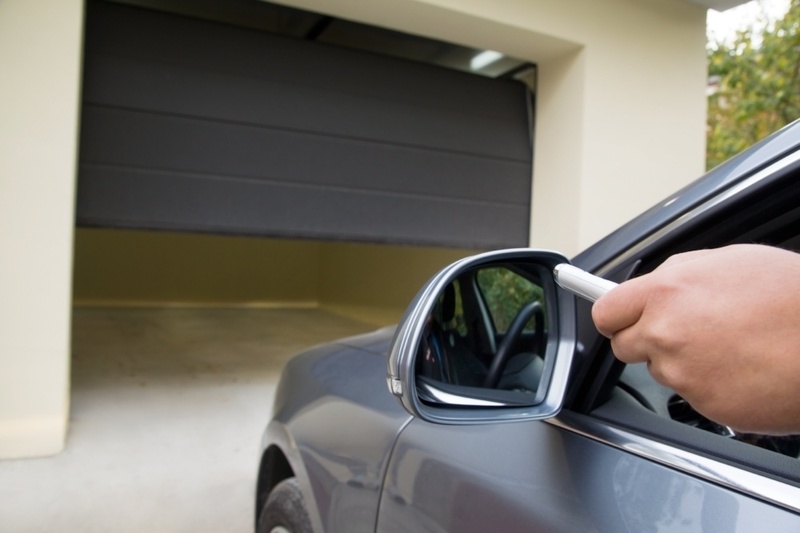 If you’re in a rush and your garage door won’t open, there’s no need to take the risk on your own. 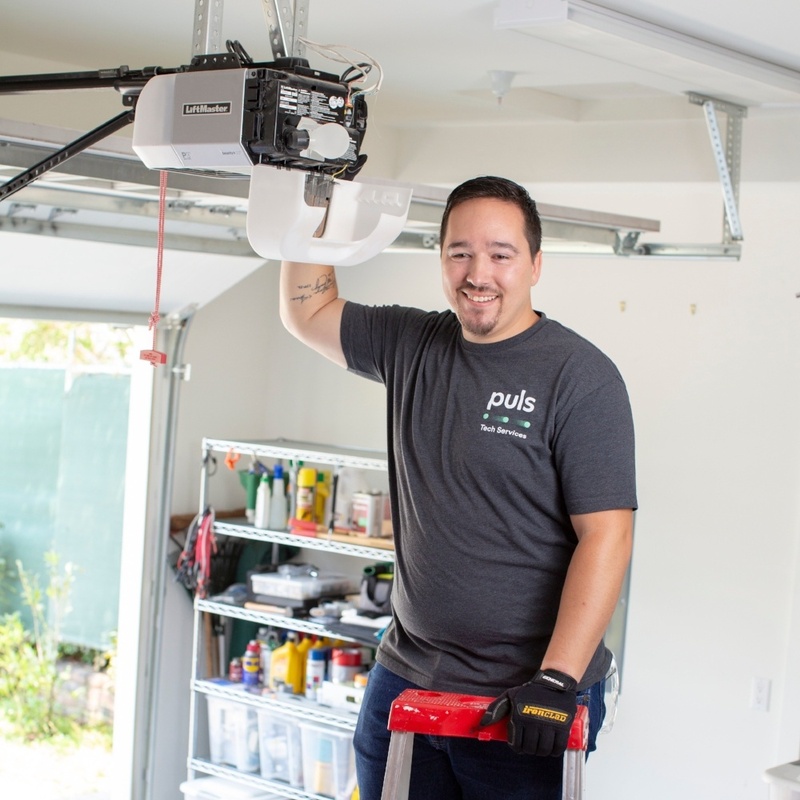 Book a time slot for a Puls technician to come and fix it for you within the same day – and perform a full 25-point inspection while they’re at it, to make sure your garage door is in tip-top shape. If your garage door won’t open when you’re attempting to use the keypad, it’s often as simple as replacing the battery. If that doesn’t work, follow the reprogramming instructions located on the door to your keypad or in the user manual. These steps are usually quick, simple, and usually get to the bottom of your basic keypad issues. If your remote isn’t working and you’re definitely within range of your garage door, there are a few steps you can take to isolate and solve the issue. Check the remote battery. If your remote has an LED light on it, see if it lights up. If it doesn’t, try using a second remote or simply replacing the battery. Of all the things to fail on a remote, the battery is most likely. See if your garage door opener is locked by checking the green LED light on your wall-mounted garage door opener button. If the green light is blinking, simply unlock the garage door opener by holding down the lock button for a few seconds. Check to see if your remote’s signal is getting blocked by radio interference by climbing a ladder and giving it a try directly next to the garage door opener’s motor. If it works from close proximity, then certain types of lights, or video game consoles, may be responsible for interfering with the signal. Other than stopping use of these items, you could try installing an antenna, which you can buy online, to boost your garage door remote’s signal. Try to reprogram your remote through the keypad by following the instructions in the manual. If you can’t reprogram the remote via the keypad, you can reset all the remotes at once by holding down the “learn” button on the motor unit for several seconds until the light turns off. Reprogram all remotes to see if they work. If they still don't, unplug the motor from the power source for one minute – this will reset the logic board and allow you to reprogram the remotes afresh. If you have more than one remote, try reprogramming a different remote to see if it works – if it does, then the non-functioning remote is broken and needs replacing. Check the tracks on the side of the garage door to see if they’re properly aligned and lubricated. If need be, straighten any bent or crooked tracks and/or lubricate with only a proper non-permeable lubricant intended for garage doors. Unscrew the back of your garage door motor unit and look for the capacitor – a white cylinder. Similar to a battery, if the capacitor is bulging or leaking in any way, it needs replacement. Capacitors can be ordered online, but you must ensure that you order the right size and type for your unit. This is also tricky simply because the capacitor may show no signs of being off. Even if it’s not visibly broken, the capacitor may be the part responsible for a non-functioning garage door opener. We understand that there’s nothing more frustrating than a garage door not opening. But how can you get someone to deal with all the hassle for you, so you can avoid a garage catastrophe and quickly get on with your day? You can simply hop online an book a garage door repair within seconds, and you can have someone at your door to fix it within the same day. Our skilled technicians will come perform a thorough, 25-step inspection of your door before you opt for a complete repair, to pinpoint exactly what the issue is, and give you a proper, adequate price quote. Puls usually charges only $39 for this inspection – about half of what the competition charges. But if you choose to go ahead with a repair through us, we’ll waive the fee completely. So, what’re you waiting for? Book a garage door repair online now to have our technicians come perform a thorough in-home diagnostic within the same day. You can even click here to get 5% off your first service with us.